I would like to introduce myself today. I am quite a big car enthusiast and for many years I have been buying and rebuilding several cars, for daily use and for the pleasure of seeing them from time to time, sitting in the garage when the work to do is bigger than I had previously planned (e g the first car I bought, a very beautiful white series 2 XJ6 that 15 years later isn't finished...) . Concerning the e type, it's very strange, but as you really don't see a real one very often, and as I had been a little bit disapointed by the xj with which I was really struggling because in those time my equipment wasn't as good as now, i had never considered owning one. Moreover, it's absolutely not a car from my generation, as I just turned 40. But a few years ago I saw a couple of really well equipped series 2 at the rallye monte carlo historical. They were red and looked so good , so out of time, that even in the middle of this incredible car park , surrounded by all those fantastic race cars , I couldn't find a more beautiful car to look at. I was yet convinced that the XK engine is a masterpiece, as I am also so the owner of a very nice XJC ( from 76 I think...) and you can imagine the rest of the story. I put a photograph of a white FHC from ecurie europe , with blue stripes on it on the desk of my computer , gone to the goodwood revival , and little by little, I realised that this fantastic car ticked all the boxes and that it would be so great to add it to my collection . But it had still rise up in price and as we certainly all do, I was one more time checking on the web that it was out of reach when one came out of the blue: a series one convertible from 1962, in opalescent golden sand, coming from a well known dealership in Beverly Hills. Not in concourse condition, of course, but complete and by having spent it's whole life in california, with very very few rust. The car was sold as a project, but seeing the photographs, I was convinced that there was a complete restoration to do, but with very little bodywork to fix. It was to be imported by a french company I had never heard of, but on this saturday afternoon, I said to myself, well you work real hard, it's time to do something a little bit crazy! 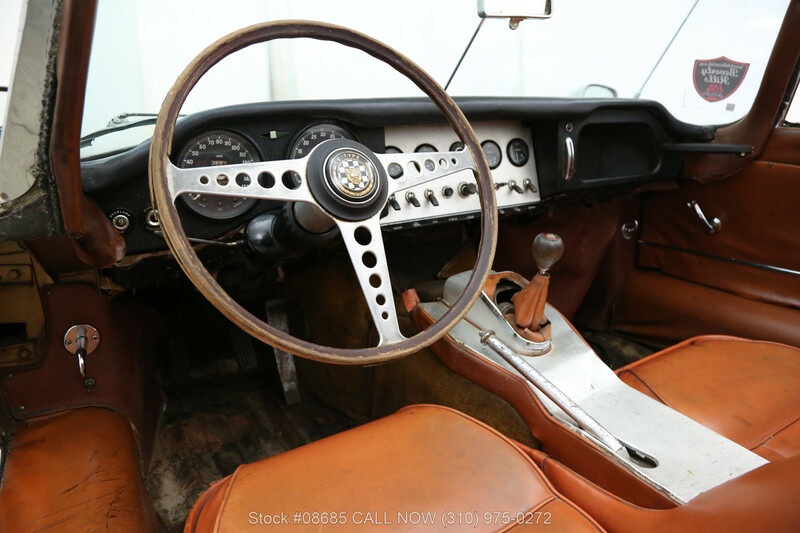 I phoned a very charming man who had the good idea to buy in the usa and sell in France those gems that we exported from europe several decades ago, porsche, triumph, healey etc... The car was in the boat, and several people had taken appointments to see it in flesh when it would arrive, several weeks later. What could I do ? I thought about it for about an hour and called the man back to make a bank transfer . Several long weeks after,checking from time to time where the boat was on the web, it was delivered a few miles from home. A man got it down a big truck and after I got down of my cloud I finally could get my e type home on my trailer! It was raining a lot, and as I had not finished to put the rear axle from the white xj6 on the car, I had to let the poor e type under a cover , under the rain. No need to say that the next week end, I worked hard with the spanners to get the xj6 out and the e type in ! I then dismantled it completely, seeing that the engine was seized, but that I had had a good feeling concerning the rust. There is some down the battery , in the back of the boot and on the left hand floor and that's it ! So far, no bad surprise. And as part of my pleasure is to do most of the job myself, I enjoy every part of the process. As my wife said, "don't hurry too much doing the restoration ! " I think she is a little bit worried about what could come next... This car is a real pleasure to work on, as I don't have to struggle on every nut being pretty much rust free. So I am a happy man , and having integrated the e type club and received my first issue of the magazine, I am now aware that there is a lot to enjoy actually driving the car ! Well , I recon it's a long introduction, but I personally like the stories behind the projects, so I decided to share mine! Last edited by Chris24 on Sat Aug 04, 2018 4:29 pm, edited 1 time in total. Opalescent Golden Sand and Light Tan interior. Hope you get to keep the interior, that would be a great result..! I will consider opening a restoration thread. I must read the restoration thread you mentioned Heuer, it looks like they have made a great job. Welcome Chris, nice story and a great project ahead. Where in France are you located? There might some fellows close by to assist if needed. I am in the south west of France, near Périgueux, and we have quite a few people from belgium around . I will put my location on the map, that's always a good idea . It sounds excellent. It will be a fantastic car to own and a superb investment. If it is rust free you should get it completed pretty quickly (1 year?). I had rust on the battery tray too. I unbolted it and replaced it with a new battery tray! Took about half an hour and cost about £90 I think. I had no rust on the sills. You should be rebuilding it very shortly I would hope, so get all those sub assemblies sent out now. Engine gearbox, axle, seats (if required). I would keep the S1 bonnet. Dont throw out of the old parts away when you take them off. They are often of superior quality to the reproductions and can be repaired. Buying imperial nuts and bolts is not easy in France. Use these guys for nuts and bolts. Re-use the originals if you can, they are generally high quality. I spent £100 on and few boxes and they speed the job up no end. Also I am skeptical about acid dipping body shells at the moment and shot blasting too - on old original cars. I might just consider removing the paint with plastic paint stripping discs, get it painted after the repairs then fill the box sections up with wax. It is much gentler on the shell and I am sure the finished car will last longer! If you are unsure about anything, make sure you ask the Forum. They know everything. And they all would like to go to Perigueux too. If you get really stuck let me know. I have a local engine builder and a house in Objat (Near Brive), so big heavy lumps can be moved around if you want. He does Gearboxes and differentials too. I drive to your area regularly. I am also convinced that refurbishing old parts can be the way to go. At the beginning of the restoration project, it wasn't so easy to know exactly what to do , because I have several cars and, even if none of them is in concourse condition ( and some are very far from it ! ) I like their patina , the smell, the story they tell with their condition. But the E is a little bit apart from those cars. I have seen a few in really tip top condition and I must admit that they make great impression. So this is the way I go. It will be a nut and bolt restoration , as I think most people have to do, the cars being more than 50 years old now. Moreover, I want my wife to enjoy the ride in it and not telling me one more time " well, this one is a nice car but...smells a little bit like petrol, isn't as shiny as it could, has got heavy steering, clutch etc...! The engine is in the hands of someone I trust, because he did very well with my lancia fulvia engine. Concerning the gearbox, having failed to find a specialist, I have planned to check visualy inside first, and maybe put it back . I think it can go quite fast for the whole project, but the friend that will do the bodywork and paintwork will start on the beginning of 2019. Thank you again for all your good inputs on the project. I hope we'll meet up one day. Hello Chris, nice region where you are located, + excellent food + wine too! Enjoy the project and do not hesitate to ask as many questions as needed. Sorry, thought you had a later car with an earlier bonnet. Definitely dont throw your bonnet away! Sounds like your media blasting is a good idea. Great project. I’m currently at the end of a similar restoration of an OGS 3.8 fhc, incl a lhd to rhd conversion and rear axle ratio change from 3.54 to 3.07. I’m writing this from Creysse, in the Perigueux region! On holiday, sadly not living here! I guess you found the best car to drive around in the Dordogneshire ! The sooner the better I imagine. Nice restoration project.